By all accounts - a match made in heaven! Farhana, daughter of Iqbal and Farida Omar, was married to Zaheer, son of Shabbir and Bilquis Kharodia at a Nikaah Ceremony held at the Kuraby Mosque yesterday (Saturday 13/01/07) afternoon. Presiding over the formal process was Imam Peer recently arrived from his Hajj trip. This was followed in the evening by a reception for some 400 guests in the Grand Ballroom of the Sofitel Hotel. Both Farhana (a CA) and Zaheer are in the accounting profession. LITTLE MOSQUE ON THE PRAIRIE is a new comedy from CBC Television (Canada) about a small Muslim community in the prairie town of Mercy, many of whose residents are wary of their new, more “exotic” neighbors. The series takes an unabashedly funny look at the congregation of a rural mosque and their attempt to live in harmony with the often skeptical, even down right suspicious, residents of their little prairie town. The sitcom reveals that, although different, we are all surprisingly similar when it comes to family, love, the generation gap and our attempts to balance our secular and religious lives. An administration traineeship position is currently available at ACCES Services INC. Recent school leavers and people from a non English speaking background are encouraged to apply. Closing date for applications is 22/01/07. For the full position description click here. Business Manager (Africa) position in the Overseas Market Development Group unit of the the Trade and International Operations. This is an opportunity to develop and manage key partnerships and networks with markets in sub-Saharan Africa to identify trade opportunities that will enable the Queensland Government and organisations to expand their business in the these markets. Congratulations to Shameema and Imraan Nathie on the birth of their third child, baby Sabreen, on Friday (12/01/07) at 7.22am weighing in at 2.92kg. 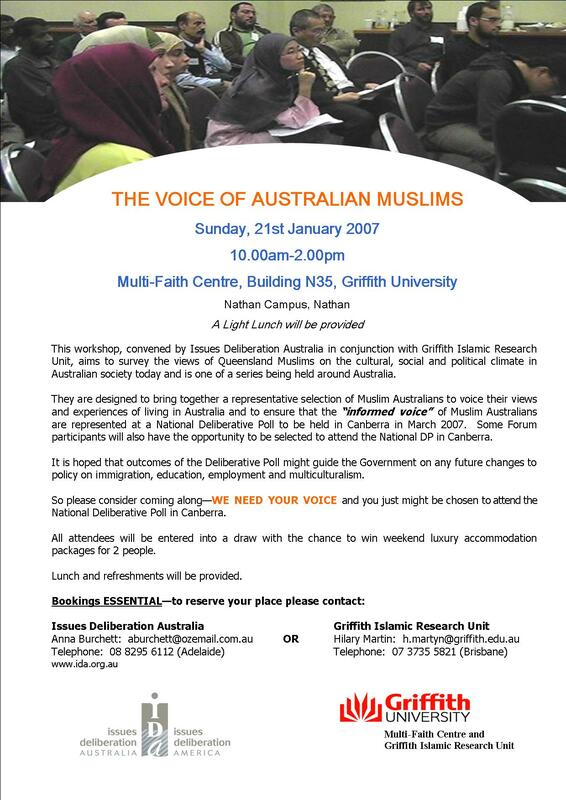 Griffith Islamic Research Unit GIRU, Griffith University Multi-Faith Centre along with Issues Deliberation Australia America IDA is coordinating and hosting a consultancy workshop at Griffith University Multi-Faith Centre on Sunday 21 January 2007, 10.00AM. The IDA Research team wants to hear the voices of Muslim people living in Queensland in the lead up to its national poll on Muslim relations in March next year. Issues Deliberation Australia America (IDA) is conducting a series of round table forums with Muslims around the nation to survey their current views and experiences. IDA’s Managing Director Dr Pam Ryan says the responses will help to inform and guide a national deliberative poll to be held in Canberra’s Old Parliament House 2 – 4 March 2007. “Deliberative polling is an internationally recognised method of public research which brings hundreds of randomly selected people together in one place to hear competing arguments on a burning issue”, she says. IDA is conducting mini deliberative forums with Muslims in Adelaide, Perth, Brisbane, Canberra, Melbourne and Sydney as a way of identifying the key issues effecting Muslim and non-Muslims living in Australia today. “Griffith Islamic Research Unit GIRU will be coordinating the Brisbane session and it will be facilitated by professional facilitators”, announced Dr Mohamad Abdalla, GIRU -Director. “I am optimistic about this opportunity for dialogue that will be inclusive of both conservative and progressive Australian. It is definitely a step in the right direction”, said Dr Abdalla. “Some of those taking part in the forums will be invited to the proceedings in Canberra on March 2007”, added GIRU - Director. Griffith University Multi-Faith centre is privileged to host this important initiative to enhance relations between Muslims and other communities in Australia through constructive dialogue. It is in line with my vision for a cohesive and pluralistic Australian society”, declared Professor Toh Swee-Hin – Director of Griffith University Multi-Faith Centre. IDA is a non-profit, non-partisan think tank, based in Adelaide and Austin, Texas which works collaboratively with the University of South Australia, the University of Texas and the Australian National University in Canberra. IDA was established in 1998 to conduct and disseminate high quality research, public consultation, education and debate on the world’s social issues. Further information about IDA and “Australia Deliberates: Muslims and non-Muslims in Australia - Building the Relationship?” can be found at www.ida.org.au. Griffith Multifaith Centre, N35 on Sunday 21 January 2007 at 10:00 AM. Halal lunch will be provided and a draw for a weekend luxury accommodation for two will be announced on the day. The Islamic Women's Association of Queensland is providing assistance for refugees and humanitarian entrants who have lived in Australia for over 6 months, but under 5 years. Settlement assistance is provided through: housing, health, education, learning English, managing finances, life skills and family relationships. ph: 3272 6355 email: iwaq-cso@iinet.net.au. This is one of many services provided by the Islamic Women's Association of Queensland, Inc., and funded through the Department of Immigration and Multicultural Affairs. The Islamic Females Association is still rallying up kind-hearted volunteers who are willing to give up their time for its Lend a Helping Hand Project. Seats for the information session are limited so RSVP by 1st February. This program does require dedication and commitment, so take that into consideration before signing up. If you would like to know more take a sneak peak at this link: http://www.mater.org.au/support/volunteer.asp. You can find out more about IFA Youth at ifa.qmt.org.au. USA - Representative-elect Keith Ellison, the first Muslim elected to Congress, swore the oath of office on a copy of the Koran once owned by Thomas Jefferson. Some have criticized Ellison for planning to use the Koran instead of the Bible at his swearing-in. Ellison requested the 18th century book for the unofficial part of his swearing in. 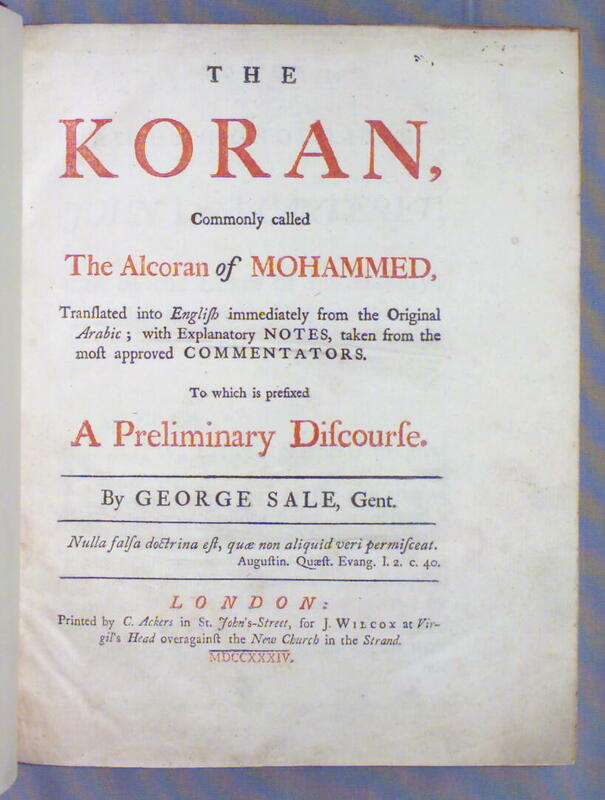 Ellison, a Muslim convert who traces his U.S. ancestry to 1741, approached the library for a special copy of the Koran to use. Firstly, a belated Eid Mubarak to the committed team at CCN! May Allah bless you abundantly for your efforts for the community. Keep up the awesome work! Attached are two advertisements from Central Queensland University, that I have been asked to pass on to you. The first ad is a position for Muslim male Research Assistant, the second is a call for participants for the above mentioned Project. Your assistance is much appreciated. JazakAllah Khair. I am a regular reader of your Crescents Community News. I was very touched with the contents of the article A Brahmin Who Sent a Muslim for Haj. By publishing this article you have, once again, demonstrated your desire to create better understanding and appreciation of different cultures and that, most importantly, we all are creations of God. This guy sees a sign in front of a house "Talking Dog for Sale." He rings the bell and the owner tells him the dog is in the back yard. The guy goes into the back yard and sees a mutt sitting there. The mutt looks up and says, "Well, I discovered this gift pretty young and I wanted to help the government, so I told ASIO about my gift, and in no time they had me jetting from country to country, sitting in rooms with spies and world leaders, cause no one figured a dog would be eavesdropping. I was one of their most valuable spies eight years running. "The jetting around really tired me out, and I knew I wasn't getting any younger and I wanted to settle down. So I signed up for a job at the airport to do some undercover security work, mostly wandering near suspicious characters and listening in. I uncovered some incredible dealings there and was awarded a batch of medals. Had a wife, a mess of puppies, and now I'm just retired." The guy is amazed. He goes back in and asks the owner what he wants for the dog. The owner says "Ten dollars." The guy says he'll buy him, but asks the owner, "This dog is amazing. Why on earth are you selling him for $10?" To claim your date for your event email theteam@crescentsofbrisbane.org.